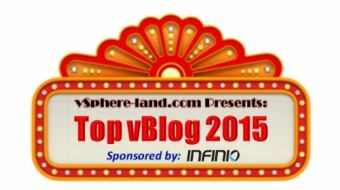 Top vBlog 2015 Voting Open! It’s that time again when you are able to vote for your favourite storage and virtualisation blogs of the year. The event is ran by Eric Siebert from his vSphere land blog and is to recognise the bloggers brining you all the latest tips, tricks and news. I’ve just voted and it takes less than 5 minutes, last year more than 1400 people voted. If you have enjoyed reading 3ParDude.com, I would be honored if you would consider voting for me. Thanks for reading the blog and enjoy casting your vote for all the great blogs out there. The results will be announced on 13/9/15.